Today some interesting rumours about the creation of the next part in the popular game series have appeared. 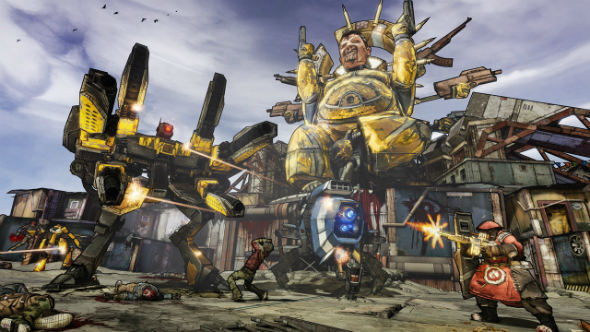 According to the unverified information, 2K Games company prepares the Borderlands 2 prequel. The new project will be set on the moon Elpis in the 5-year long period between the events of the first and second game’s parts. The players will get a chance to choose one of four characters: Wilhelm, Nisha, Athena and Fragtrap. All these heroes are the lieutenants of Handsome Jack, and some of them are familiar to the users thanks to the instalments’ DLCs. Besides that, the Borderlands 2 prequel will have the great amount of the various types of weapon, including new lasers and the equipment, which allows freezing the enemies and turning them into the blocks of ice. Also there are rumours that the Borderlands 2 prequel, which will be titled Borderlands: The Pre-Sequel, is being under development for such platforms as PC, Xbox 360 and PS3. 2K Games company hasn’t officially confirmed or denied the appeared information yet. However, let’s hope that the creators of the Borderlands universe prepare for their fans some interesting surprise. Let us remind you that currently the work under the debut episode of the upcoming adventure game - Tales from Borderlands, which was announced in December 2013, - is in progress.